What’s better than Buffalo wings on game day? Three words: Buffalo chicken meatballs! One big reason to love this even more is they make for mess-free eating, unlike regular Buffalo wings (hello, sticky fingers!). All the flavor you love from the classic American comfort snack is transformed into an easy family dinner you can serve for dinner, pack in school lunches, or even make bite-sized to serve as an appetizer. Now, let’s talk about the most important part of Buffalo chicken meatballs: the hot sauce. Yes, you can use your favorite kind and even go for a milder flavor for more sensitive or picky palates, but for a true Buffalo-style experience, Frank’s Hot Sauce seals the deal, so it’s worth tracking down for this recipe. As for the dipping sauce, it’s ranch all the way. 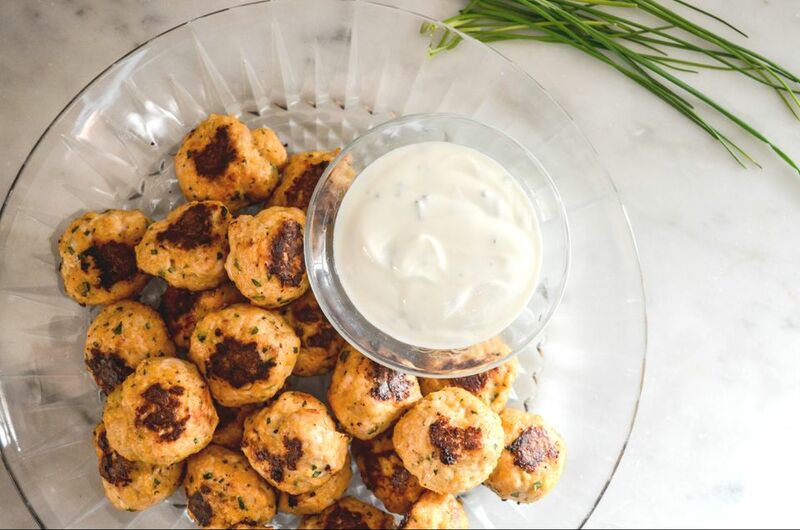 This one is a lightened-up version made with plain yogurt, sour cream, chives, and lemon juice, skipping the usual ranch spices to let the seasoning in the meatballs take front and center. If you want a more classic take on ranch dressing, we’ve got you covered here. Gather the ingredients. Preheat the oven to 450 F. Generously brush an 11-inch by 17-inch baking sheet with olive oil. In a small bowl, beat the egg, butter and hot sauce together. In a medium bowl, combine the chicken, garlic, pepper, salt, parsley, panko, and the egg mixture. Stir until well mixed using a rubber spatula or fork. Form the mixture into 20 equal sized balls. The mixture will be very wet and sticky; dabbing your fingertips in a bit of water helps form the balls. Arrange them in a single layer on the prepared baking sheet. Bake 15 to 20 minutes, turning once, until golden all over and chicken is cooked through (165 F on an instant read thermometer). In a small bowl, whisk the yogurt, sour cream, chives, and lemon juice together. Serve the meatballs with the ranch dipping sauce on the side. To thaw frozen ground chicken, let it sit in the fridge overnight or add the tightly-sealed container to a bowl of cold water for 30 minutes until it’s thawed out. Forming the meatballs is a little tricky because ground chicken is wetter than ground beef. Keep a bowl of water nearby when shaping them to dab your fingertips in for easier rolling. You can also make these in advance. Shape the balls and flash freeze them for Buffalo chicken meatballs on demand. Bake them straight from the freezer following the cooking directions, adding an extra 5 minutes baking time. You can swap in ground turkey to make Buffalo turkey meatballs if you prefer. Panko breadcrumbs help bind the meat and seasonings, but you can swap in gluten-free breadcrumbs so everyone can enjoy them (regular breadcrumbs work, too).